O.K. so summertime is winding down, schools are starting up again, Ann Arbor is buzzing with students, and the country is getting ready for a new president. For me, August was a great month. It started off with a full 2 weeks of a completely empty schedule. I looked back in my calendar and realized that it was the first time I have had two weeks off since Christmas of 2007. I took the time to rest, practice, do a little personal recording, teach a few lessons, and hang out at home. Now I am feeling refreshed and ready for the fall. It will be an exciting end of the year. My wife and I are expecting our first baby in November and we are so excited. I have already been playing music and singing to him, and last week I felt him moving for the first time. Everyone is telling us how different things will be, some things good and some bad. I am not sure what to make of it all, but I know that I have been inspired to play more music and with a passion I have not felt before. After two weeks off, getting back on stage can feel a little stiff, but I had a great gig to get back into the swing of things. The Kirtan group was invited to play at a gathering called Yoga for Peace at Ford Field in Dearborn, MI. It was Sunday afternoon August 10th. It was a little chilly and the threat of rain was there, but the event was well attended and the atmosphere was calm and relaxed. The idea was that there was free yoga classes happening all day, followed by some guided meditation, followed by some more yoga and then the Kirtan group would do some chanting with everyone. We were supposed to start the music right as a class ended, so we had to get there early to set up before it all started. When we showed up, someone was there with a tiny sound system already to go. It was for a group of musicians that were going to play background music for the yoga classes. The system was a little too small for the venue, so I offered to combine it with our system, (I didn't want to suggest they take it all down, since the lady setting it up had just laid her last chord). So I was tested right off the bat to make our two systems work together in just a half an hour. Not an easy task, but everyone hanging around was very helpful and we got a nice system complete with monitors and extra mics. The Kirtan group was a little concerned about this gig since we were there without 2 of our regular response singers, (we only have 4, and one is the lead chanter). When the event started we noticed that the group playing the background music had 4 singers, so we asked if they wouldn't mind joining us on stage for our chanting. They agreed and we ended up playing with a nice full sound. By the end of the chant, which lasted about an hour, there were a little over 100 people all chanting. It was great energy and felt very fulfilling. The rain held off and the day ended up as a great success. (click for pictures) Not to mention there was a person in the crowd that liked what we did and asked us to be a part of a huge event in September at the EMU Convocation center in Ypsilanti, MI. It is called One Peace, and they are expecting anywhere from 3,000-10,000 people and they want us to open the event with kirtan chanting. I am excited to see how that turns out. The Yoga for Peace event gave the group great practice and renewed energy for the next monthly kirtan, which was just 5 days later on Friday. The attendance was a little down from the norm, probably due to the summer and whatnot, but the energy was high and the music was sounding great. The group really has been making great strides since January, when it started rehearsing once a week. That is really the secret behind any successful group, lots of time together playing the music. No amount of discussion, or pre-planning can make up for time spent in the music making experience. It doesn't matter what type of music, or how many people are in the group, if you are paying attention and playing well, the quality of the music is always increasing. So after those two peaceful nice shows, I was back in the swing of things, and things did start to swing steady and fast. The very next night I was again playing drumset with the Nick Strange Group at Fishbones in St. Clair Shores, MI. The group plays mostly songs composed by the leader, Dan Orcut, with a few covers thrown in to fill out the evening. Dan has been around the Ann Arbor music scene for many years and has played with a ton of drummers. The music is fun for a drummer. Lots of different feels, rock, reggae, swing, soca, funk, etc. The energy is high and Dan likes to keep the quality of the music very high, which I appreciate greatly. It can be difficult to do that at a place like Fishbones where they have 20 t.v. 's all flashing and spreading the focus of the crowd. This night was especially challenging. It was right in the middle of the Olympics and it just so happened that this was the night that Michael Phelps swam in the relay that won him his 8th gold medal. It happened during a song called Lucinda, right before the guitar solo. The crowd went crazy. They were so loud you couldn't hear the band, and like the professional wallflowers we were, we did not stop the music, so once it calmed down, the song picked up and I think it actually helped to carry the energy of the moment. Somewhere deep in the subconscience of those at the place that night lies a strange connection between Michael Phelps and a girl named Lucinda. Something about that gives me satisfaction. The rest of the night went along smoothly and the music sounded great. I heard through the grapevine that the drummer I usually sub for in this group is moving to California, so I may be writing about them much more in the future. The following Tuesday I found myself sitting on the floor with Meeta Banerjee in a store in downtown Ann Arbor called 10,000 Villages. A few years back Meeta and I played there for their grand opening. I guess Meeta was out one night and happened to walk in. She started talking with a worker, telling them about the gig and they asked if we would play again, so there we were. I like to think of the gig as a live practice. People walk in and out as we play. All we see are butts and crotches as they walk by. It really makes you turn your atttention inward, focusing on the music. I love to play, so I can get into the music almost no matter where we are, and I joked with Meeta before we started that it is possible we could play better than we ever have on this night. She laughed, but when the gig was over we both agreed that the chemistry between us that night was working very well, and the music was great. I have said it before....you never know! You can never count out the possibility of great music happening no matter what the situation. I often tell my students that once a piece of music starts, it is a living thing complete with a pulse, a personality, and direction. If you honor that with focus and good intention, then the possibilities for making great music are always there. The following Friday I got invited to play tabla at Crazy Wisdom Tearoom in Ann Arbor with bassist Rob Crozier, guitarist Randall Beek, and a drummer known as "O". It was a simple gig. No rehearsals, no charts, no expectations. I just showed up with my drums and played. The first half of the show consisted of some compositions that the group had written, mostly free form, but very groovy. I was able to lock in nicely with the drummer and we had a great time. The second half of the show was much more free form. Two other musicians showed up, a trumpet player, who's name escapes me, and a sax player named Piotr Michalowski who specializes in free form improv. And that is exactly what happened for the next hour an a half. With the group growing in size, the volume increased greatly and I was left for the most part, watching my hands move, but not hearing anything. One of the hardest parts about playing the tabla in fusion groups like this is getting the sound levels correct. Tabla are such a quiet instrument in comparison to the drumset that it takes a lot of amplification and a nice mic to level the playing field. After a good portion of craziness the music did settle down a bit and I was able to hear myself. All in all it was a fun, interesting, and worthwhile gig. I always appreciate any opportunity to think outside the box and just play in the moment. The following Tuesday I took a drive just south of Ann Arbor to a nice place called the High Scope Retreat Center. 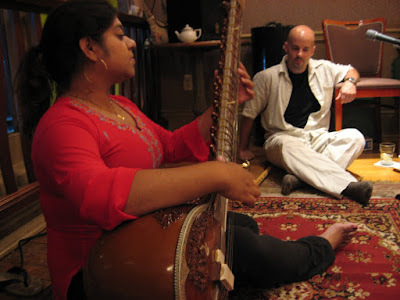 I was slated to do a demonstration of tabla and Indian classical music for the Ann Arbor Boy Choir summer camp. There were 21 boys ages 9-17 and I was their main evening activity. I wasn't sure how interested they would be in listening to me talk and play for an hour, so I brought a guitar and a video just to fill some time. To my surprise however, we talked about Indian classical music for over 2 HOURS! I could not believe how attentive, interested and inquisitive they were. It was such a nice surprise. When it was over I hung around a bit to listen to them rehearse. It turned out to be a very nice evening which left me inspired and energized about teaching tabla. The following Saturday Scott Brady, Meeta and I were up in Crazy Wisdom again. The atmosphere in the tearoom is so great. It has nice tall ceilings, comfortable seating, and it is intimate. It feels full with 20 people, and packed with 30. We always have a great time and this time was no different. We played, talked about the music and instruments, and played some more. I was happy to have Scott with us. He has been working so hard at learning the bansuri, (Indian flute), and it has been paying off. We did a lot of our usual pieces, but I was so pleased to also do a good bit of improvising. It was just a fun night of Indian style music. All in all it was a great month of music, and left me fully energized and ready to start my "day job" at Go Like The Wind the following Tuesday. The fall looks to be filling up nicely with all kinds of different shows including the long awaited C.D. release party for Paledave's new C.D., a big chant at EMU, more Indian classical, more Nick Strange, and the biggest gig of all...the arrival of a new baby boy! I look forward to writing about it all, so please check back soon. Thanks for reading. I love it. "all we see are butts and crotches"....you didn't mention the occasional child who is at our height. Anyways...I wish we did have a recording from the 10,000 villages...it was one of our better "practices"